Welcome to the 2nd Annual "Merry Fluffy Christmas"
Visit all the blogs for more chances to win! All that is worth a Grand TOTAL of $502.15 Yes over $500 in prizes here on Mommy's Favorite Things!!! How awesome is that! You can read all Sponsor Spotlights Here to get a better idea of the item I received and what you're going to win! I would love the blueberry one size diaper! I'd love to win the Blueberry OS!!! I most want to win the newborn Grovia! Thanks so much for the chance to win! The Baby Legs prize pack! Same knit different dye custom yynm. I am most excited about the Little Bee! I have yet to try one and I love what their company stands for and does! I'm most excited about the Blueberry OS Diaper! everything but I do need more soakers. I've been wanting to try a Little Bee Co. diaper, so I'm most excited about it! I am so excited about the newborn grovia! Either the bummis beautiful basic or the thirsties duo wrap & hemp prefold... I really like both! Tough choice! I'd say the Blueberry of the BabyLegs! Wow! What a great prize package! I'd love to win the custom soaker or the longies! So hard to choose but I think I would like the blueberry most... I have been wanting to try one! I'd love to win the Christmas longies! I would love the Christmas longies. My family already thinks I'm crazy for using cloth so why not go all out and plan my sons Christmas outfit around longies! It would be cute and it may teach a family member that cloth is easy, cute, and fun. I'm excited about all of the NB diapers!! I can't choose between the Blueberry OS, Wild Mountain Pocket, the Graham Bear Wear Fitted, Nifty Nappy's New Red Barn Bitty Bum or the Sprout Change Diaper! There's SO MUCH AWESOME HERE! The wetbag - I need another! I am excited to try all of them, I am new to Cloth diapers and have not tried a whole lot of things. I would love the longies. Any pack, but most of all the bummis! Sprout change and the longies! The Red Barn Bitty Bums are SUPER adorable! :) Excited about that that! I can't even decide what diaper I'm more excited about! Some of them are new to me and I need to go check them out! It is so hard to choose! I love everything. I am really excited about the Little Bee diaper. I love the company and have been wanting to try their diapers! I want the Blueberry OS or the babylegs package! The Wild Child Christmas Longies Are INCREDIBLE!! I would so love to win the 2 NB diapers from Little Bee Co! I would love the GroVia AIO. I'd love to win ANY of the prizes but I would really love to try the wool dryer balls! I'd really love to win the Bamboozle, Super Lite and Easy Fit for my grandson. Thank you! hard to pick, but probably the 2 NB little Bee Diapers. They are so cute! I'd really like the Grovia diaper - I don't have any and would like to try it! I would like to try wool, so I am most excited about the custom soaker and the longies! So many great prizes! I really want some babylegs and some dryer balls! I'd love to win the Earthy Crunchy Mama: Thirsties Duo Wrap and Prefold. christmas longies, how cute! But really, everything looks awesome! The Snickerdoodle custom soaker! I've been wanting to try one! We'd really like to try the Baby Snickerdoodles: Custom Soaker. Definitely the Blueberry OS! Thanks for the chance! If I had to choose what I want to win the most, it would have to be the Same Knit, Different Dye custom longies! tough call! They all look awesome! But I think I'm MOST excited about the 2 NB Little Bee Co AIOs!!! I can't really pick one. The Christmas longies are adorable. I love Mom 4 Life and I think the Santa Baby Legs would be fun. What an AWESOME prize pack. If I could only pick one, I'd say I am most excited about the little bee cloth diaper. I want WOOL!! Oh yummy wool!! With a new baby girl here, she could use some fluffy wool! Do I really need to pick just one?? I'm truly most excited about ALL of it. I can't choose just one! I am excited about the soakers because I've been wanting to try one. You have an AWESOME giveaway!! Thank you! 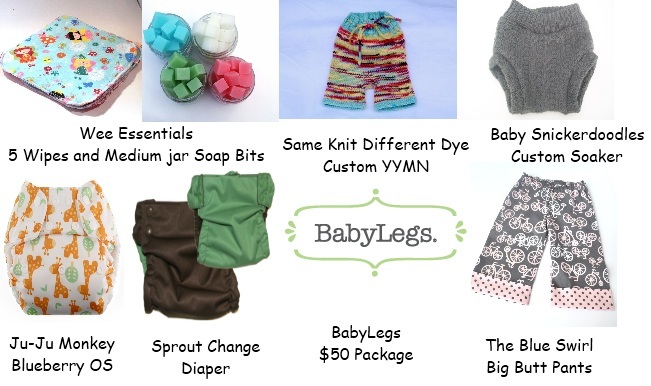 I want the BabyLegs: $50 Prize pack!! Wool dryer balls, lol. Never tried them! wow this is awesome!! thanks for doing this! The little bee co newborn diapers. Excited to try the newborn diapers!! I most want to try the grovia all in one! Oh man! Where do I start! I would love the Thirsties and prefold. I only have pockets and AIO's and would love to venture out! I am most excited about the Little Bee Co. diaper! All of it would be awesome. But the blueberry os would be great. so many great prizes! I'd love to try the blueberry! I'd like to try the Wild Mountain pocket. I'm most excited about the little bee newborn diapers! That's hard to choose! Probably the baby legs. The Sprout Change or the newborn GroVia are things I've always wanted to try! 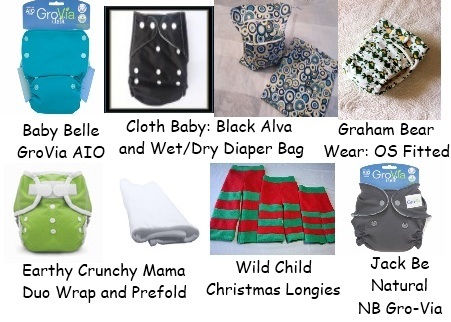 I would love to win Wild Child for Babies Christmas Longies! Little Bee Co newborn diapers! I would really really love a little bee co cloth diaper!!! I would really love to have the Little Bee Co. diapers in NB size!! I am most excited for the BabyLegs package! I really want to win all the cloth diaper items the most. I am still so new at this and trying to learn which are best for my three babys in diapers. i would like to try the blueberry one size diaper! I really want to win the Blueberry OS because I've been dying to try them! It's so hard to choose, but maybe the BabyLegs $50 package? The Little Bee Co. diapers! I'm looking forward to the thirsties duo wrap and prefold. It's so hard to choose! I think the Same Knit Diff. Dye wool is what draws my eye most! I would love the Same Knit Different Dye YYMN. I want to try the Bamboozle! I'm most excited about the grovia diaper! I would be happy with any ONE prize from this package, but would love the wool soaker. My favorite would be the Babylegs or the Ju-Ju Monkey: Blueberry One Size Diaper! The monkey blueberry diaper. What a fantastic group of prizes. The baby legs, any of the diapers... ALL OF IT! The baby snickerdoodles custom soaker.... but seriously how do you pick just one? these are all awesome prizes! 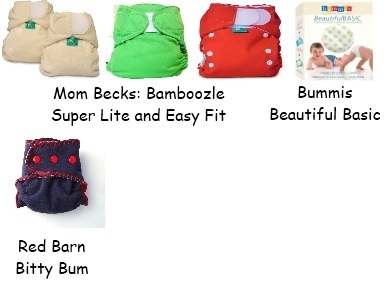 I would love the Blueberry One Size Diaper and I am also excited about the Bummis: Beautiful Basic Pack! I have always wanted to try a grovia AIO! I would love to win the $50 for Baby Legs. I need so many things in this package, but I think the thing I want most is the gift certificate for BabyLegs. I want more for my sons, but because they don't really NEED any more than we already have, in the interest of saving money, I haven't bought any in a long time. I love me some BabyLegs! Love to win any of the diapers...haven't tried any of the brands and would be interested to see how they do! I would love to win the Wild Child for Babies: Christmas Longies! I would love to win all of it but would lot to try the tots bots bamboozle diaper! They look so soft! I'd like to win the babylegs! I love them! I would be most excited to win the yymn custom! the snickerdoodle soaker! I really am in love with it. Oh gosh! Any of the OS diapers! I'm a soon to be FTM and I've never heard of most of these products so I'm excited to try them all! I want to win any of the wool things! ANY THING! I never win and I have 4 lil girly bummz to cover. I dont kniow how to post this, so Im going to write my FB name here & click on anonymous so it could get posted. I am most excited to win the NB size diapers because I'd love to CD our 2nd baby from birth. little bee co for the two nb diapers! Too many to count. If I have to pick one maybe the little bee co one size with hemp. I want so many of these though. This is quite the generous giveaway. wow! what a great package. I am excited about the easy fit and the blueberry. I have been wanting to try both for awhile now. Omg so hard to choose just one thing! Ok well I think I am going to say the same knit different dye yymn since I have never had the cash to get custom knits for my girls. With the BabyLegs package a close second! 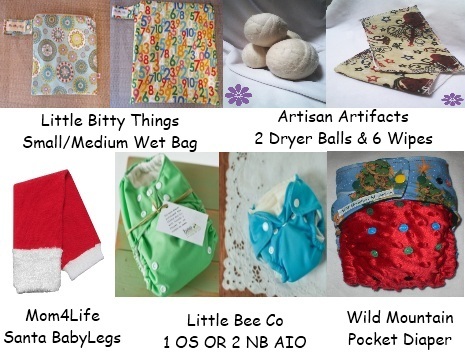 I would love to win the Little Bee 2 newborn diapers! Seriously? I wouldn't know! I just started using cloth diapers on my third baby, so I would really love to win ALL of it. I've only made my own diapers so far, and they haven't been the greatest, so if I won I'd most be looking forward to trying out all of the different diapers! Most excited about the Wild Child Christmas Longies! I want to win the NB Grovia the most. bummis basic or mom becks! I am most excited about the Little Be Co diaper, I've never tried one before & it sounds amazing! I want the baby snickerdoodles custom soaker!